Why does saying this seem so inappropriate in damp and dismal January? If you’re struggling with the January blues (I am a little bit) then you might like to treat yourself by baking (and eating) this warming ginger cake. 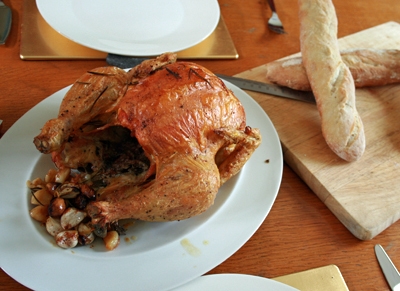 The original recipe comes from Nigel Slater’s Kitchen Diaries (the first one). It is a comforting, old fashioned ginger cake (tasting rather like the shop bought McVities Jamaica Ginger Cake, only better) and is very easy to make. To prove this point my daughter made the one pictured all by herself. She will not however be photographed for this blog anymore – she is nine and well aware of her rights. The ginger flavour is quite subtle so if you want more punch then I suggest doubling the quantities of powdered and stem ginger. It is a very sturdy cake that keeps well for a week or so wrapped in foil. It actually tastes best after maturing for three or four days. Cut off a square and zap for 20 seconds in the microwave. It’s lovely by itself but even better served with ice cream, clotted cream or custard. Set your oven to 180oC (fan). Take a 20 x 20 cm tin and line with baking parchment. I like to take the baking parchment all the way up the sides of the tin with extra to fold over the cake when storing. When I doubled the ingredients once for a large party I used a 22 x 33 cm tin. Sift the flour with the powdered ginger, cinnamon, bicarbonate of soda and salt. Put the golden syrup, ginger syrup and butter in a saucepan over a low heat until melted. Then add the diced stem ginger, sultanas and sugar. Turn up the heat and let the mixture bubble gently for a minute, stirring often so that it doesn’t stick to the bottom and burn. In another bowl add the eggs and milk and whisk with a fork. Pour the syrup and butter mixture into the flour and stir with a metal spoon, then add the milk and eggs and mix until everything is well incorporated. Tip the mixture into the lined cake tin and bake for 35-40 minutes (45-50 if you’ve double the quantity). Leave the cake to cool in the tin and then wrap it up in the baking parchment and store in an air tight container. Leave to mature for a couple of days if you can. Rabbit stew looks like dog food. No amount of herb garnish or photographic brilliance can make it look good. So instead I offer you a photo of my favourite ‘rabbit’ apron. I don’t cook rabbit very often but when I do I always use this recipe which started out life as a Nigel Slater one. The ingredients remain roughly the same but I’ve tinkered with the cooking method, preferring a slow cook in the oven to one on the hob. I only buy wild rabbit from my local farmer’s market but I have to admit I find cooking rabbit a real challenge. Even decapitated the body is unmistakably a rabbit (visions of Watership Down dance in my head) and I’m too squeamish about this to joint the rabbit myself. If you’re pathetic like me I recommend asking your butcher to do this bit for you. I ask my husband and he does it willingly because this is one of his favourite meals. This is not a difficult recipe to make but it does take a long time to cook and picking the meat off the bones at the end is a bit fiddly. Nigel, prefers to serve the meat on the bone but I like to concentrate on eating rather than worrying about choking. Some of the rabbit bones are tiny and troublesome. If you’re not a huge fan of game (like me) then rabbit is a good one to try. It tastes rather like the dark meat from a really good free range turkey. The sauce in this recipe is amazingly rich with the tarragon adding an important note of freshness. We should probably eat more wild rabbit, they are plentiful and farmers see them as pests and shoot them to preserve their crops. Although there is no closed season for rabbit hunting a moral farmer* will not shoot while they are raising their young. Ben likes his stew served in a giant Yorkshire pudding – unconventional, but delicious (but then again anything served in a Yorkshire pudding is usually good). I have also used the meat as a ravioli filling with the sauce tossed through the pasta at the end before serving. In a heavy based casserole dish melt the butter over a medium heat and cook the onions until translucent. Remove the onions. Season the rabbit pieces well with salt and pepper and brown in the pan for around 5 minutes on each side until you have a nice deep brown colour. Add the onions back in. Add the rosemary, thyme and wheat beer to the pan and bring to the boil. Put a lid on and cook in an 150oC oven for 3 – 4 hours until the rabbit meat is tender and comes away from the bone easily. The amount of time this will take will depend on the age and provenance of your rabbit. Wild rabbits will generally take longer than farmed (but will taste better). Let the stew cool and then pick the meat from the bones. This is a finicky job. Discard the bones and put the meat to one side. Then pass the liquid through a fine sieve, mushing up at the end with a spoon to get all the best onion juices, then add to the rabbit meat. Heat through again on the hob and then add the cream, then the tarragon and season with salt and pepper. You can prepare this in advance but refrigerate before you add the cream and tarragon. Reheat in a 160oC oven for 30 minutes, then finish with cream and tarragon on the hob. In my small collection of recipe books there are at least four versions of ‘chicken with 40 cloves of garlic’ and I’ve always promised myself that if I ever have a bumper crop of garlic this would be the first thing I would cook. Finally this year (after over 10 years of having an allotment) I have struck gold with my garlic and I feel as though I can spare 40 cloves for just one dish. But which recipe should I use? In the end I opted for the most straight forward sounding one – Alistair Little’s in Nigel Slater’s ‘Real Food’. When I found the original programme from 1998 where they cook this recipe and saw them serve it with nothing more than bread and wine, I knew I was onto a winner. This dish is certainly delicious, but despite all the fuss (i.e. 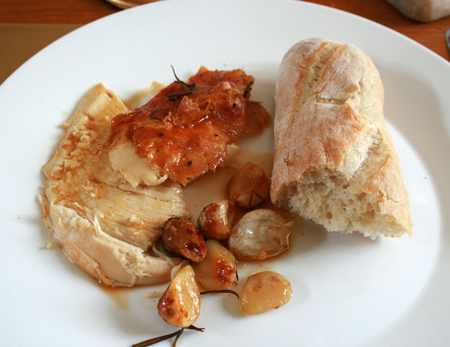 chefs falling over themselves to bring you ‘their’ version) it is basically roast chicken with garlicky gravy and some roasted garlic on the side. I do love this simplicity but the best bit for me was the bread accompaniment (see recipe below) and the smell filling our kitchen as the garlic and chicken were roasting. Preheat the oven to 240oC. Cut the lemon in half and put into the cavity of the chicken. Drizzle some olive oil over the outside of the chicken, season well with salt and pepper, and rub in with your hands. Bake in the oven for 25 minutes until golden brown. 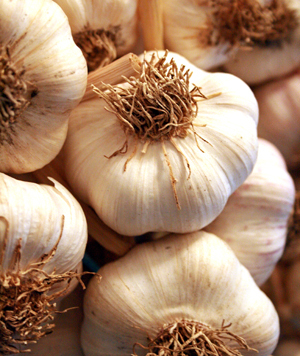 Meanwhile, prepare the garlic. Break up the bulbs into cloves, you don’t need to peel but remove any really dry skin that comes off easily with your fingers. Take the chicken out of the oven, scatter the garlic, rosemary and bay leaves around it, lower the heat to 200oC and return to the oven for another hour. 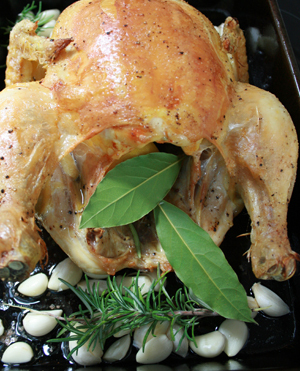 When the chicken is cooked, tip out the lemon and remove it from the roasting tin onto a serving plate. Then use a slotted spoon to remove nearly all the garlic cloves and put those on the serving plate as well (save 3 or 4 in the tin to mash into the gravy). Give everything left in the roasting tin a good mash with a fork (including the lemons). Then add the chicken stock and put over the hob stirring well with a wooden spoon to get all the bits off the bottom of the tin. Let it bubble away for a couple of minutes until you have a light gravy. Strain into a serving jug and serve with the chicken. NOTE: In my books very little is said about how exactly you go about serving/eating this dish. This is what we did and whilst it wasn’t very elegant it was a lot of fun. Carve big chunks of chicken, pour over the gravy, eat with roughly cut baguettes (see recipe below) spreading the garlic onto the bread and dipping it into the gravy. Get stuck in, use your fingers and don’t forget the wine. This is a simplified version of the recipe handed out to my husband Ben when he attended the French Baking course at the School of Artisan Food. Ben has made these many times and in our view the simplifications don’t affect the finished product at all. I bought the course as a present for his birthday and without meaning to be selfish it has turned out to be a present for the whole family. Food-wise there are few things better than fresh baguettes for breakfast – especially when they are made by someone else. Mix all the dry ingredients together and then add the water and mix with your hands until it comes together. Knead the dough for 10 minutes. Shape into a ball and place in a bowl covered with cling film for at least a couple of hours to rise but you can leave it for up to 4. It should come nearly to the top of a large mixing bowl. Knock back the dough with your hands, bring into a ball and divide into 4 or 6 equal portions, depending on the size you want. Shape each portion into a sausage pulling out length-ways at first and then rolling to even out. Don’t worry if they look a bit rough. Now you’ll need a tea towel which is impregnated with flour (Ben has one of these set aside for this purpose). Lay the tea towel over a high sided baking tray letting it hang over the sides. 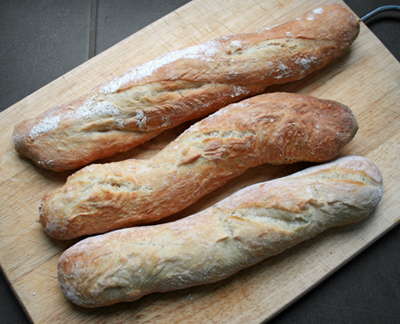 Put one baguette along one edge of the tray and then make a fold in the tea towel next to the baguette so that it comes up the side. Then lay the next baguette on the other side of the fold. Repeat this for the third and fourth baguettes. The purpose of this is to stop the baguettes touching each other and to avoid having to buy a special baguette tray. It’s a bit tricky to explain so here is a photo. Use the same technique for the others using another tray. Allow to prove for about an hour. 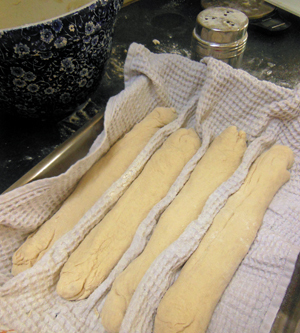 Transfer the baguettes to some thin baking trays scattered with a little flour or semolina to stop them sticking. I used two with three on each. This is quite a tricky process as the dough is quite floppy. Try not to knock out the air that has been created but don’t worry too much if the shape isn’t perfect. Slash the tops diagonally across with a very sharp knife and bake at 250oC for 12-15 minutes (for the 6 smaller ones), or 20 mins (for 4). Allow to cool a little (if you can wait that long) and serve. NOTE: To reheat cook in the oven at 250oC for 3-5 minutes until crispy. 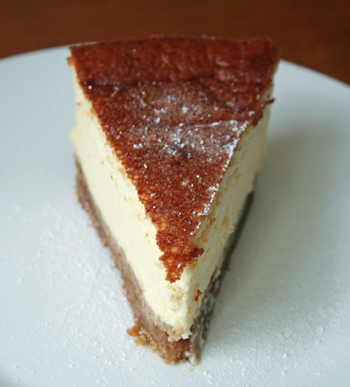 I’ve been using a Mary Berry recipe for baked vanilla cheesecake for years and I’ve always been perfectly happy with it. Last week though I decided on a whim to try Nigella’s New York version instead and my goodness it was so much better. The texture was smooth and creamy, it was not too sweet AND there were no cracks (probably due to the addition of cornflour). In true Nigella style this is an expensive cheesecake to make (£11.46 based on my Tesco shop using branded items such as McVities and Philadelphia) but it’s huge and therefore ideal if you’re catering for a lot of people. Butter the bottom and sides of a 24cm round, springform cake tin. For the base, mix together the butter, sugar and biscuit crumbs and press firmly into the bottom of the tin. Chill for one hour. For the filling, start by setting your oven to 170oC. Mix together the sugar and cornflour. Beat in the cream cheese, egg yolks and vanilla extract by hand or with an electric mixer. Then slowly pour both the creams in, add the salt and lemon zest and beat some more. In a separate bowl whisk the egg whites until stiff and then fold carefully into the cheese mixture using a metal spoon. Tip into the chilled base and bake for one hour and fifteen minutes (the recipe said for between one hour and one and a half hours so I went with the middle ground). Turn off the heat (don’t open the door) and let the cake stand in the oven for two more hours. Then open the door and let it stand for another hour. Chill in the fridge and serve cold. You can dust the top with icing sugar before serving if you like. NOTE: This is lovely eaten just as it is but I served mine with a cheat’s raspberry coulis (basically a tin of raspberries in syrup whizzed up until smooth). I think it would also taste nice with any other fruit coulis, or a caramel or chocolate sauce. Over the last few weeks I’ve been experimenting with tagines. 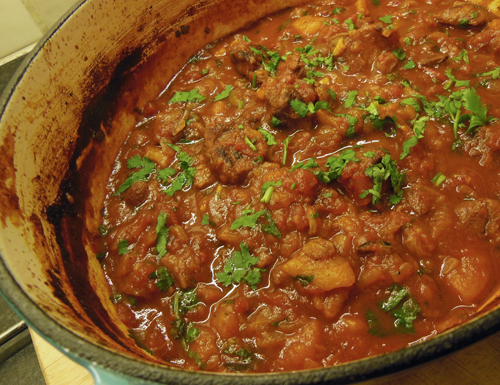 First I tried Lindsay Bareham’s lamb and apricot tagine. It looked beautiful and was quick to cook but tasted a bit insipid which was bizarre considering all the ingredients involved. I then tried a Nigel Slater recipe with the same name and I knew I’d found a winner. His version was slow cooked and absolutely packed with flavour. Nigel Slater is a brilliant food writer but in my view he should never have been put on television. Is it just me who wants to drag him to the hairdressers? He’s also a little bit creepy. Like Nigel this dish is not a looker but don’t let that put you off because it tastes amazing. It’s a bit tricky to source but don’t be tempted to miss out the preserved lemon – it cuts through the sweetness of the fruit and really lifts the whole dish. 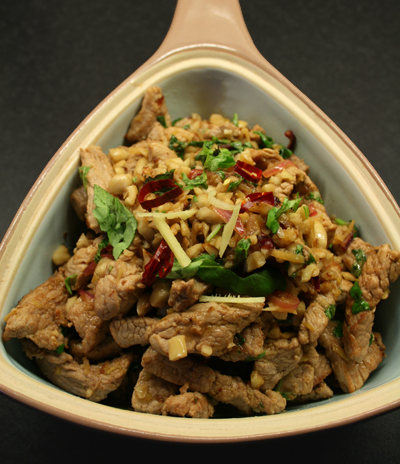 In a bowl toss the diced lamb in half the ground spices, cover with cling film and leave in the fridge for at least four hours, although overnight is best. Set your oven to 160oC fan. First brown the lamb in batches in a frying pan with a little oil until it is nicely browned on all sides and set aside. Then, in a heavy-based casserole dish with a lid, cook the onion, garlic and the remaining ground spices in a little oil over a medium heat until soft and slightly coloured. Add the sultanas, honey, saffron, stock, tomatoes, apricots and meat to the pan. Bring to the boil, cover with a lid and cook in the preheated oven for 2 ½ hours. If using a preserved lemon, cut it in half and discard the interior pulp. Finely chop the skin and stir in to the tagine. Alternatively, add the preserved lemon paste and give it a good stir. I found that after 2 ½ hours the sauce was beautifully thick and did not need reducing. If yours does look a little thin then Nigel suggests removing the meat with a draining spoon and boiling the sauce over a high heat until it thickens up, before returning the meat to the pan. Just before serving add the coriander and mint. Serve on a bed of couscous (see below). It is also nice with rice. Make up the stock and bring to the boil. Remove from the heat, add the saffron and the juice of half a lemon, then the couscous in a stream. Give it a quick stir, cover with cling film and leave for 15 minutes until all the liquid has been absorbed. Before serving fluff up the couscous with a fork.